I’m also posting this in response to Marilyn’s challenge over at Serendipity, which is weekly and is also to post a story, or some words, accompanying a photo. Today, DraliTips is proud to present some help on cleaning your bathroom. 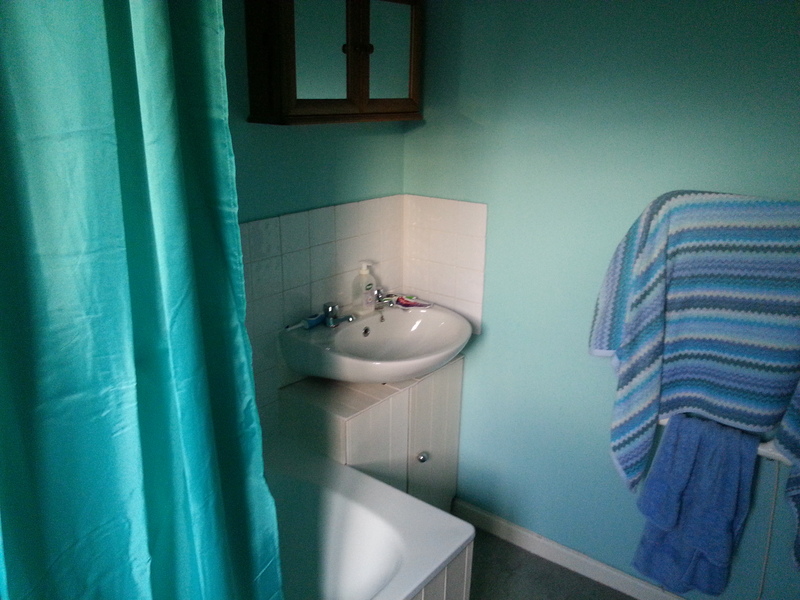 I have managed to take a fairly neutral picture of my bathroom, and it has just been cleaned after all! First, and most important, don’t leave it for months between cleans. It’s amazing how long it takes if you do that! Clean that sucker even when you don’t have your parents visiting. Once your shower curtain has achieved more than 50% mould cover, replace it. See my lovely new shower curtain? Nice. That hard-to-reach black mould above the shower? Leave it alone. You’ll only hurt yourself trying to reach it, and it’s perfectly harmless(a)! Before you start, be sure to don the appropriate protective gear. Gloves, goggles and an apron are a must. Some form of breathing apparatus is also recommended. Though it is tempting, do not use your toothbrush to clean the grouting between the tiles. It will make it taste funny! Use someone else’s instead. Above all, have fun! Remember, look after your bathroom and it will look after you. (a) May not be perfectly harmless.